A Laser Cutter is pretty much a CNC router with a weird and very very thin tool. As far as installing Smoothieboard in a machine goes, they are probably the simplest machine to set up. They can also be quite dangerous, so, be cautious. This is a step-by-step guide to connecting your board to the various components of the laser cutter, configuring everything, from the beginning to actually cutting material. Some guides have been written ( or are being written ) for converting specific machines to Smoothie. Lasers will make you blind. In an instant. In the blink of an eye, quite literally. Never have the machine powered while the door is open. Eyes can not be replaced. If the machine does not come with a switch on the door that turns the laser off when the door is open. This is stupid and dangerous. Please install that switch. They can burn your house, and they can burn your eyes, be careful. The Laser module is the part of Smoothie that allows you to control laser cutters. In general, laser cutters use a CO2 tube to generate the laser beam used for cutting and engraving. Those tubes contain CO2 gas, and a high-voltage Power Supply Unit is used to pass electricity through the gas, generating the beam. Using G-code, you tell Smoothie where to move and when to cut. Smoothie moves the motors, and the Laser module talks to the laser power supply to tell it when to turn off and on, and using how much power. 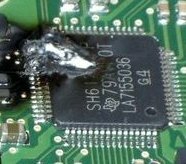 Be very careful with the laser tube side of your Power Supply : voltages there are commonly around 40 000 volts, making it very dangerous. If you are not qualified to handle this kind of voltage, please contact a professional. Always make sure everything is powered down before manipulating anything. For laser cutters, you will get some extra features ( in particular nice laser-specific screen information on panels ) if you use the “cnc” version of the firmware. Though the normal ( edge ) version will work fine. See flashing the firmware and choose the file called Firmware+Cnc.bin. In order to control the power of the laser tube, the laser PSU reads a PWM signal as it's input. Please look at the datasheet for your PSU to know which connection that signal is wired to. Both Ground pins are easy to find, and the PSU input you find in the manual/datasheet, now all you need is to find a PWM pin on the Smoothieboard. There are 6 of them, but 4 of them are used for the step pins for stepper motor drivers. Those for alpha and beta you won't be able to use as you use those drivers to control the X and Y axes. Depending on whether you have a Z axis, your gamma axis step pin could be used. It is labelled ST3, on the JP12 header, near the M3 stepper motor driver. You probably do not use your delta ( M4 ) stepper motor driver on a laser cutter, so that pin can also be used, it is labelled ST4 on the JP15 header near the M4 stepper motor driver. The other two are found near the microcontroller and the MOSFETS, on the JP33 header, and are labelled PWM0 and PWM1. Choose which you will use, all have a GND header close-by ( all are unlabelled ) to make it convenient for wiring. Now you need to find which GPIO pin/port number corresponds to the PWM pin you chose, so you can tell Smoothie which you'll be using in the configuration file. 2.2 STP3 Only if you are not using a Z axis/the gamma driver. Make sure you set gamma_step_pin to the “nc” value. The unlabelled pin in JP12 is GND. 2.3 STP4 Only if you are not using the delta driver. Make sure you set delta_step_pin to the “nc” value. The unlabelled pin in JP15 is GND. 2.4 PWM0 Only if you are not using the first small MOSFET ( X8 ). All pins of JP10 are GND. 2.5 PWM1 Only if you are not using the second big MOSFET ( X15 ). All pins of JP10 are GND. If needed, replace the 2.5 value for laser_module_pwm_pin with the pin you chose in the wiring section. Save the file, reset the board, you are now ready for laser testing. Exactly how to wire your Smoothieboard to control your laser power supply is going to depend on the PSU itself, so we highly recommend you read the documentation for yours. This is an example that should be the most common case, which you are most likely to encounter : the chinese power supply with “H L P G IN 5V” connections. In this example a RECI power supply but this should apply to most chinese power supplies. 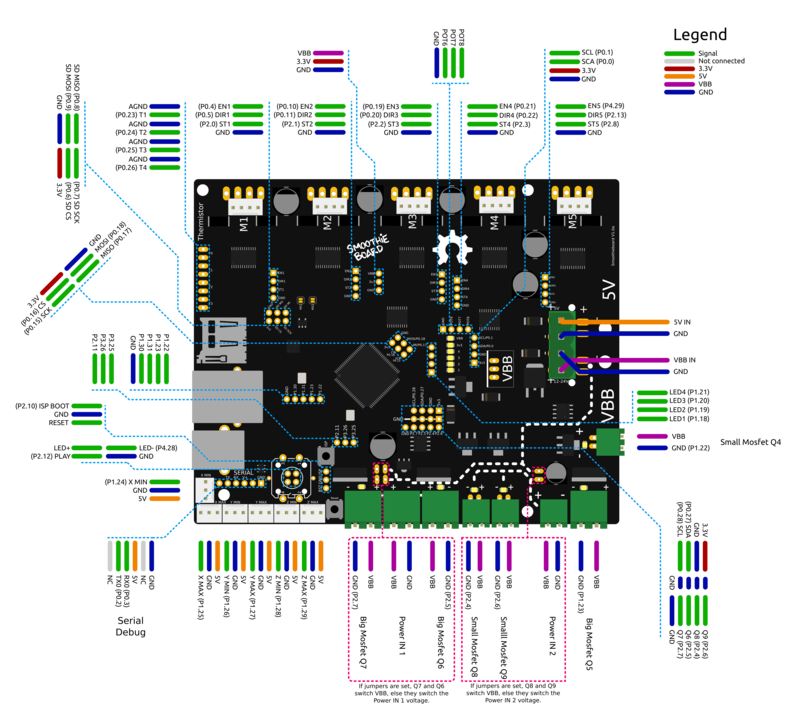 The basic idea is this : pin 1.23 ( hardware PWM-capable ) is configured as open-drain and inverted ( 1.23o! ), then connected to the L ( Low ) TTL input on the power supply. Ground from the Smoothieboard is connected to ground on the Power Supply. , IN is connected to 5V, setting the laser power at full ( but it can still be modulated by Smoothie's PWM ). Here you could in theory replace the jumper by a potentiometer, allowing you to manually adjust the maximum laser power. The wiring above probably won't work on a K40, which are fairly weird machines ( cheap comes at a cost ). For K40, see the several build logs linked to at the top of this page. In particular, you'll likely need to increase the pwm frequency, and wiring might need to be different depending on your model. Make sure your laser cutter enclosure is closed and that everything is safe. Wear laser protection googles, even if the machine is properly closed. Make sure your machine has a proper enclosure, and a switch on the door that turns it off when the door is opened. Do not do anything until this is properly setup. Lasers can make you blind. And bionic eyes are not there just yet. Here is how Smoothie laser control works : G0 and G1 are exactly the same command, they take positional parameters ( X10 Y5 Z3 for example ) and move the tool to that position. The only difference is that when using G0 the laser stays off, and when using G1 the laser is on, only during movement. You can set the power for the laser by using the Shift parameter. Values goes from 0 ( 0% ) to 1 ( 100% ). Shift : The S parameter sets the current power of the laser, when it is activated, from 0 ( 0% ) to 1 ( 100% ). M221 Snnn globally scales the laser power provided by G0/G1 by nnn percent. So M221 S75 will scale the laser power to 75%. Smoothie does not ( yet, it's being worked on ) support native laser raster engraving. However, as Smoothie interprets G-code unusually fast, a method to do raster engraving is to convert bitmap images into G-code files. Here are some tools that allow to do this. The main issue here is sending the gcode fast enough, and there is a tool on the github called fast-stream.py that will send it as fast as possible. I have managed over 100mm/sec feedrate using this script to send the gcode. bCNC is program which makes it convient to use Smoothie as a CNC mill or laser cutter, and better yet, it is free! It also comes with several features useful for CNC and laser work, such as a work coordinate system, basic CAM, and a remote pendant web app. Failure to properly configure bCNC for use with smoothie can result in a your machine crashing, parts breaking, and being sad. Be careful and check your work. 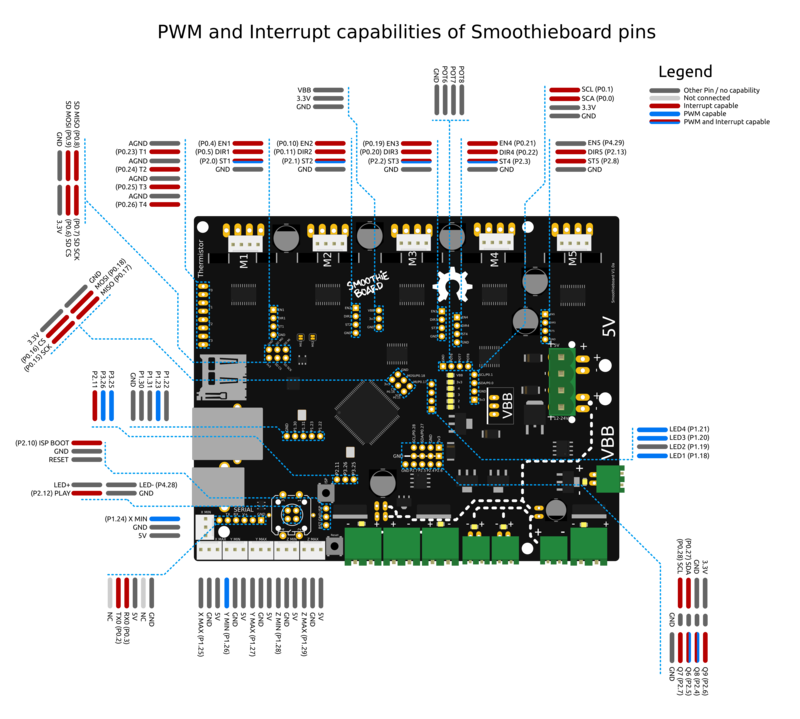 The first step is to update your SmoothieBoard to the latest, edge, version of the cnc firmware build, as support for bCNC is relatively new. Remember, before you upgrade to a new firmware, backup your config, config override and old firmware. See flashing firmware for more help. The second step is to get bCNC, which is available at https://github.com/vlachoudis/bCNC. Simply download and extract the archive or bCNC and run bCNC.bat after installing all of the dependencies as listed on the ReadMe. Once installed, select Smoothieboard from the drop down menu on the communication panel under the File tab and edit the machine configuration under the Tools tab. Once all of these things are done, you are ready to use bCNC with Smoothie! Unfortunately bCNC is not 100% compatible with smoothie. It mostly works, but feedhold does not work as expected, and after you do an abort or stop, bCNC may need to be exited and restarted as it currently does not handle the way Smoothie does abort properly.